Meet Jilin meern Khay, Prime Xenomediator of the Centran Algamation. And I know what you are thinking, just like Terrilian Reya. Sort of. Only the difference is that Jilin isn't from Central so she isn't quite as arrogant. She didn't like the feelings of loneliness that Empaths experience so she joined a Martial Arts community on her homeworld. And one other little thing: Her abilities have been fully switched on for quite a while now.A Ronin with the skills of a Ninja and an Honor Code worthy of Bushido. Woe be unto any l'lenda who would dare to think he could take possession of her.Meet Vennias. Not just a l'lenda but a varinda, adept at using both his body and mind as a weapon. But like all true Rimilian warriors this blonde haired giant with green eyes is firmly convinced that the wenda he has chosen to become his memabra need only obey in all things.Nothing too spoilery above, but be careful from this point on.If you have forgotten the events of the [b:The Warrior Victorious|517109|The Warrior Victorious|Sharon Green|http://d.gr-assets.com/books/1207162166s/517109.jpg|505043] allow me to remind you.Our heroine is transported to an alien planet where she is repeatedly lied to, emotionally manipulated and essentially put on display in the hope that one of the over-muscled over-bearing Males will lay claim to her in order to further some secret agenda.In the end, the bad people lost and the good people won. That was three months ago. Things are different now. Here's a brief description that should explain how things have changed.Our heroine is transported to an alien planet where she is repeatedly lied to, emotionally manipulated and essentially put on display in the hope that one of the over-muscled over-bearing Males will lay claim to her in order to further some secret agenda.Not as different as you might have expected?I was really feeling like I can't believe this is going to be a replay of [b:The Warrior Within|2058281|The Warrior Within (Terrilian, #1)|Sharon Green|http://d.gr-assets.com/books/1348987806s/2058281.jpg|2063460] - the banding, the forcing her to get all hot and bothered, the forcing her to walk until she keeled over - but then we go straight to the Savages - [b:The Warrior Enchained|517103|The Warrior Enchained|Sharon Green|http://d.gr-assets.com/books/1175465749s/517103.jpg|505037] - to the letting her leave on her own - [b:The Warrior Within|2058281|The Warrior Within (Terrilian, #1)|Sharon Green|http://d.gr-assets.com/books/1348987806s/2058281.jpg|2063460] - to the absolute obedience to the letter - [b:The Warrior Challenged|517107|The Warrior Challenged|Sharon Green|http://d.gr-assets.com/books/1207162248s/517107.jpg|505041] combined with the feeling like a monster phase - [b:The Warrior Challenged|517107|The Warrior Challenged|Sharon Green|http://d.gr-assets.com/books/1207162248s/517107.jpg|505041]. 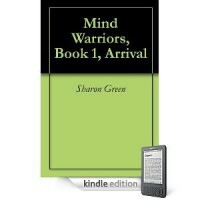 And then...We reach the second half and begin to break new ground - although there was a bit of [b:The Warrior Rearmed|711858|The Warrior Rearmed|Sharon Green|http://d.gr-assets.com/books/1343481081s/711858.jpg|698120] when we meet the Conspiracy of the Headband. As we learned before, Empathy is only one of the mental abilities that can be developed. Terry developed both precognitive and telekinetic powers. Jilin's tend toward altering the physical world around her.By the time I got to the rather surprising events at the very end, I couldn't wait to see what happened next.